Michael Fisk graduated from Monache High School in Porterville, California. While in high school he was a four-year member of the marching band, concert band, jazz band, and concert choir. While a member of the marching band, he marched in the 1996 Tournament of Roses Parade, the 1998 Macy’s Thanksgiving Day Parade, and the 1999 Hollywood Christmas Parade. After graduating, he attended College of the Sequoias for two years and was a member of the concert band. Mr. Fisk continued his education at Chapman University, graduating with a degree Music Education. While attending Chapman University he studied trombone under David Stetson (a former graduate from Tustin High School). There he was a member of the Chamber Orchestra, the University Symphony, and the Wind Ensemble. Then, Mr. Fisk attended National University and received his Single Subject Teaching Credential. In 2015 he received his Master’s Degree in Curriculum and Instruction from Concordia University. Mr. Fisk has had many different jobs before working at Tustin. When he moved to Southern California, he got his first teaching job at Western High School as the brass coach where he worked for three years. The final year he was considered the assistant band director. After he left Western High School, he worked at Oxford Academy as the junior high school jazz band director. He took that jazz band to play at the House of Blues in Anaheim. While working at Oxford Academy, Mr. Fisk also worked at Savanna High School as their brass coach for one year. In 2005-2006 Mr. Fisk and his wife taught at Peterson Elementary School in Huntington Beach where they directed the 4th and 5th grade bands. 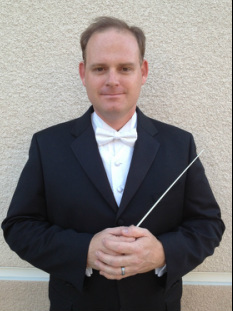 Mr. Fisk has been the Instrumental Music Director at Tustin High School since 2007. During his career at Tustin, Mr. Fisk has worked with the Marching Band to earn a spot in the SCSBOA Championships numerous times. They received 7th place (twice), 9th place (twice) and 10th place, and 12 place. The Winterguard has earned two 3rd places and one 2nd place at their Championships. The Drumline received 1st place in their division Championships in 2011. The Marching Band has marched both at Disneyland and California Adventure. Mr. Fisk moved to Orange, California to pursue his education. There he met his wife, Lindsay, in the Trombone section at Chapman University in 2002. They were married on July 7th of 2007. In 2011 they had their first son, Cameron. In 2014 they had their second son, Kyle.